NitroScore, a powerful new tool, available free and online, lets you determine your ability to pay off a college loan based on the college and major you choose. 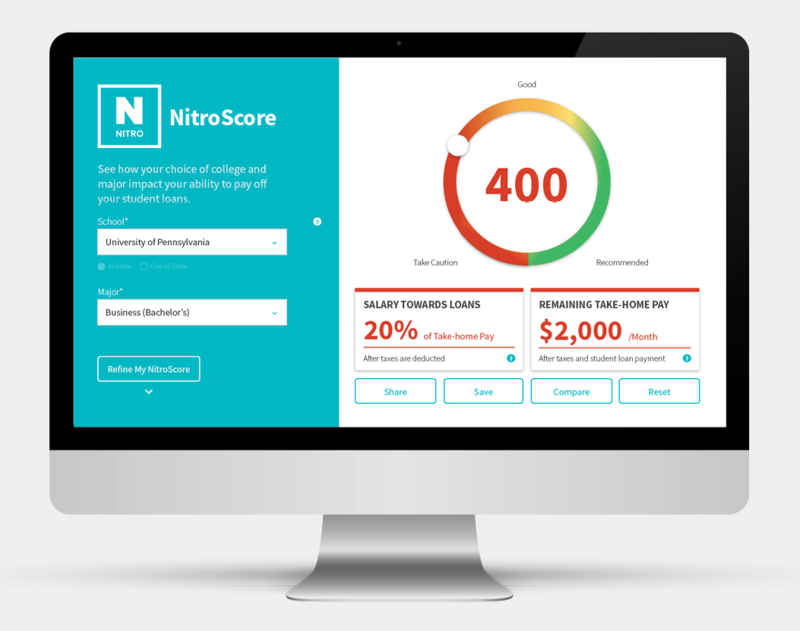 Fueled by advanced analytics, using real-world, government-supplied data on college costs and data on after-college salaries provided by PayScale, NitroScore allows you to compare schools and majors to determine which are the best buys—and help you avoid overwhelming student loan debt. A college education should be an open door to success, yet many students find themselves coming out of college unnecessarily saddled with too much debt. NitroScore is designed to answer the question, How much can I afford to borrow and not be unreasonably burdened by student debt? Students often don't understand how their choice of major can affect whether or not they will be able to afford to pay their student loans after graduation. NitroScore helps remove this ambiguity. So what are the potential financial consequenses of college and major selections?